Sometimes you get films which, on paper, just simply shouldn't work. And to be honest more often than not, they don't. But now and again you get an exception to the rule, and thankfully that has come in the form of Scott Sanders' latest film, Black Dynamite. Starring Michael Jai White (Spawn/The Dark Knight) in the title role, the feature follows tried and tested formulas often found in the old school Shaft movies, along with the 1972 blaxploitation film, Super Fly. Then proceeds to turn, the sheer absurdity of those films, way up to 11, resulting in some of the funniest moments seen on screen this year. Most pleasing was the distinctly vintage feel, from the funky, jazzed up music, to the grainy 70s style of filming which lent itself marvellously to the film. What was perhaps an even bigger surprise was the plot not being completely ridiculous and managed to flow with some degree of clarity. Some may feel I'm talking complete nonsense considering you find the story climaxing with the main protagonist caught in a totally unexpected fight to the death with Richard Nixon (seriously...). 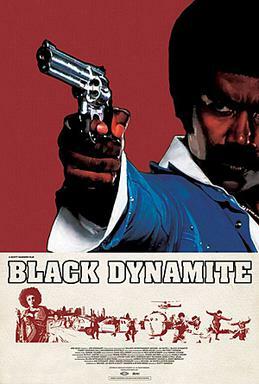 Black Dynamite was strangely at its most humorous however, when it was at its most subtle. Such moments as BD giving a speech and the audience noticing the boom mic purposely poking its head from the top of the screen. However it takes real talent to go one further and have the actor himself purposely look directly at it, and still make it funny. You could argue the humour is aimed primarily at more stoner audiences but in reality I fail to see how anyone with a funny bone in their body couldn't laugh continuously through the film from beginning to end. Michael Jai White - who also help penned the screenplay - probably gave the most iconic performance of his career, and after he's long retired he most likely be remembered for the role of Black Dynamite. However what was great to see, was the sheer amount of enjoyment he had while doing it, and if he wants to milk it for all it's worth, then he is more than welcome to it. There wasn't any particular stand out mentions for the supporting ensemble, but they all poked fun at the typical stereotypes often associated with these films to great effect. Very reminiscent of the 1988 film, I'm Gonna Git You Sucka - am I the only one who remembers that film? I'm Gonna Git You Sucka, Shaft, Super Fly, Don't Be a Menace to South Central While Drinking Your Juice In The Hood. Black Dynamite is showing in selected cinemas now. Northern Irish audiences will be able to see it in the Queens Film Theatre from Tuesday 21st - Thursday 23rd September 2010. Seriously recommended viewing. Great review! Black Dynamite is absolutely hilarious and the filmmakers know to keep it fast-paced and short so it doesn't get old. The boom mike scene was a laugh riot and I also loved one of the stuntman getting replaced mid-scene during the fistfight near the end.